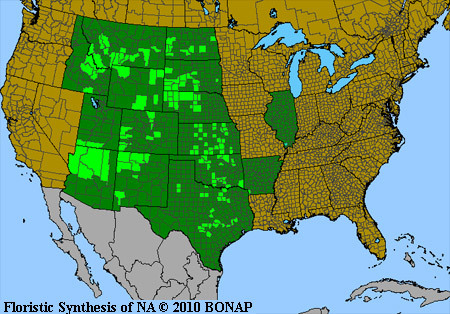 Cactus are indigenous to the Western Hemisphere, are found in their greatest concentration along the Tropics of Cancer and Capricorn, and are native to every American state except Vermont and Maine. They are found in deserts, on seashores, in mountains, on plains, balds, and glades. 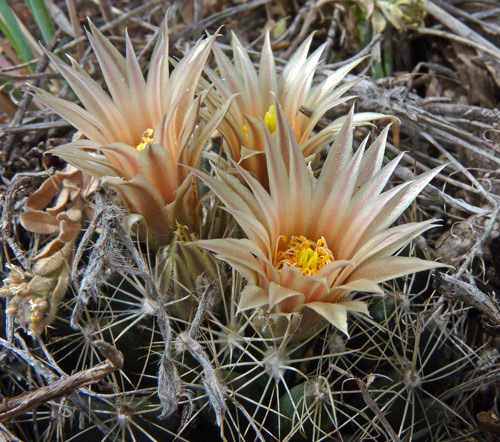 Cactus are as evocative of the West as Sagebrush is, and the two plants often grow near each other. Cactus come in a number of shapes, their flowers are often very large and attractive, their fruits are edible (some delicious, some not so), and they have evolved a number of structures and processes that make them perfectly at home in what we humans usually call "a hostile environment": They have a tough, waxy outer layer that reduces moisture loss; they produce chlorophyll not in leaves but in the outer cells of the stems; they convert absorbed water into a mucilaginous liquid that can be stored in large quantities in tissues capable of expanding; and many Cactus root easily into new plants from broken pads/stems of older plants. "Cactus" is Greek for "prickly plant"; the word was used by Linnaeus in the 18th century to describe a prickly, thistle-like Asteraceae found in Italy. The name "Cactus" was again used in the 19th century for the newly discovered spiny, drought resistant plants of the Western Hemisphere. Click for Echinocereus. 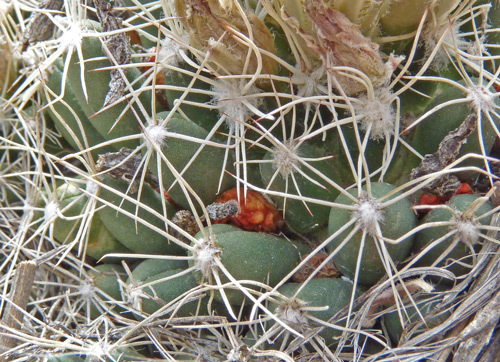 Click for Sclerocactus. Click for the Opuntia (Prickly Pear) Cactus. Escobaria missouriensis. 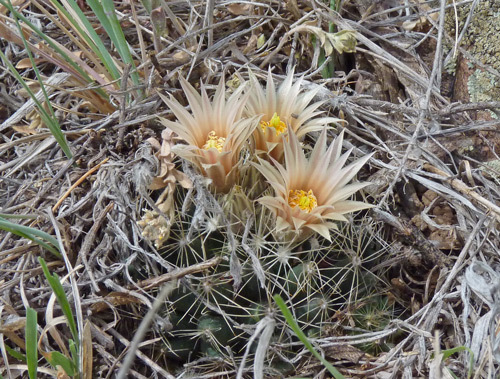 Synonym: Coryphantha missouriensis. (Missouri Pincushion Cactus). Durango Open Spaces, May 1, 2012. 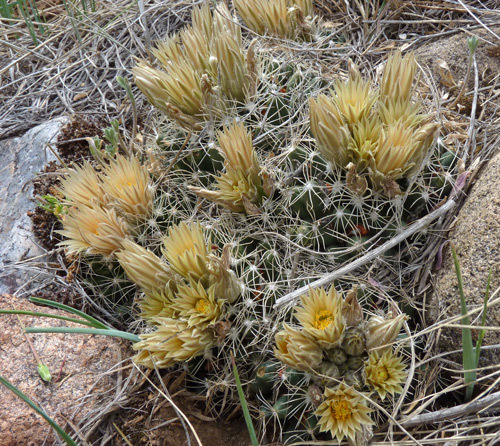 This unusual cactus is relatively uncommon in the Four Corners area and is so small that it easily escapes notice. Typically the plant grows to only 2 or 3 inches tall, including the half of the plant body that is below ground level. Flowers are followed by green seeds that mature into bright red berries the year after the flower blossoms. Missouri Pincushion prefers prairie and desert grasslands and is abundant in some areas of the West. Click to read about characteristics of Escobaria vivipara, another species in this genus. "Koryphe" "anthos" is Greek for "summit" "flower". The type locality of this species is along Missouri River hills; thus the species name. Very fine, curved spines overlap each other creating intricate patterns. Last year's dried red fruits can still be seen tucked into the tubercles. This seven inch beauty is composed of more than a dozen small plants.